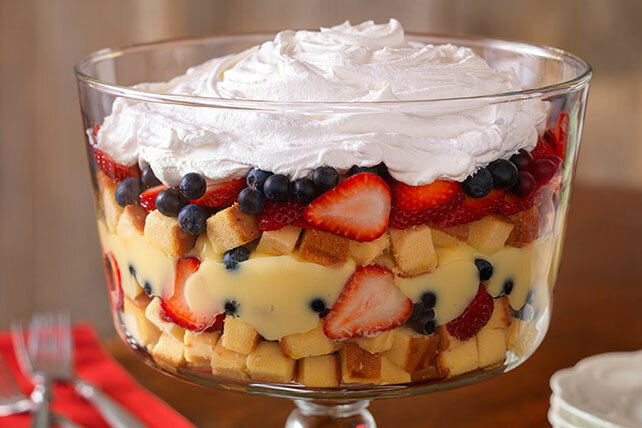 Layer fresh strawberries and blueberries with pound cake and creamy pudding to make a Fresh Berry Trifle. This berry trifle is definitely a crowd-pleaser! Beat pudding mix and milk with whisk 2 min. Layer half each of the cake cubes, strawberries and blueberries in 3-qt. serving bowl; cover with pudding. Repeat layers of cake and fruit. Top with COOL WHIP. This dessert can also be prepared in a 13x9-inch pan. Try our Healthy Living version of All American Trifle.